The first genome I bring news of isn’t available yet, but I’ll be very interested to see the results when it is. The species is Asclepias syriaca, but the name you’re more likely to recognize is milkweed. These plants grow all over the place back home. If you’re not familiar with them, their most distinctive trait (in my own opinion) are their seedpods (pictured on the right). The name, which I believe applies to the whole genus Asclepias, comes from the white latexy — and toxic! — sap that oozes from broken leaves or stems. The other reason to be familiar with these plants is that they serve as the sole source of food for monarch butterfly caterpillars. The caterpillars retain so much of the defensive toxins produced by milkweed plants that adult butterflies are in turn toxic to many predators. So that’s why milkweed the species is cool. What’s interesting about milkweed the genome? 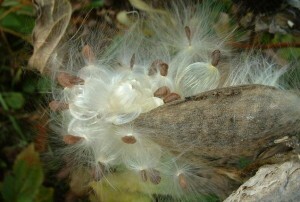 Well milkweed will join only a small number of non-domesticated plant species with sequenced genomes (currently less than 1/3 of flowering plant genomes in our list come from non-domesticated species, while out of a quarter million recorded flowering plant species, only a tiny percentage have ever been domesticated. *) The milkweed genome sequencing project is also only the second plant genome project I know of to use Illumina short read sequencing**. This is important to note because Illumina combines the shortest read lengths (it requires the genome to be assembled out of the smallest puzzle pieces) with the lowest price tag to sequence a complete genome. *** If useful plant genomes can be produced using this much cheaper sequencing technology, it will probably encourage many smaller research groups that work on non-model species to attempt to generate their own genomes. I’m thinking particularly of ecologists, who, almost by definition, tend to study obscure non-model species where it would otherwise be very difficult to justify the cost of a genome project. For now the best resources to read about the milkweed genome project are the abstracts from this year’s Botany and Plant and Animal Genome conferences. 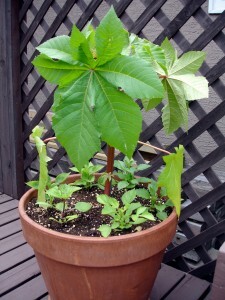 Agnes P Chan et al., “Draft genome sequence of the oilseed species Ricinus communis,” Nat Biotech advance online publication (online 2010), http://dx.doi.org/10.1038/nbt.1674. h/t to Aaron for the pointers to today’s topics. *Personally I’m much more interested in studying domesticated plants, but even so, it’s hard to study the effects of domestication on genomes without being able to compare to lots of species that remained undomesticated. **The first was the cucumber genome. ***The last time numbers I heard for genome sequenced with Illumina was ~$1000/GB, but that’s doubtlessly already out of date. ****To stick with the puzzle analogy of assembling a genome, having a genetic map is like being able to look at the picture on the front of the box the puzzle came in. Even if you don’t have all the pieces to connect different parts of the puzzle, you can still place the pieces you have put together at roughly the locations they should be in the complete picture. *****How much do I enjoy deadly plants, you ask? I might actually watch the Syfy channel’s movie coming out next weekend that featuring killer trees … ’nuff said. i didn’t know that a milkweed seed pod was so pretty…it looks like a mouse! I have two small grandchildren living with us. Is this plant poisonous enough that I should avoid planting it in my yard? Someone sent me some of the beautiful seeds, but if it is really deadly–likely to make a toddler ill, I would think twice about planting it… I also have a 4 y.o. who likes to make “soup” from garden plants…. mint, nasturtiums, grass, and other flowers and leaves…. would you plant the milkweed seeds in a child’s garden?